The Lehigh Valley Iron Pigs, Triple-A affiliate of the Philadelphia Phillies, have taken bacon to a whole new level of awesome. Unveiling uniforms for the upcoming season, the team decided to have some fun and introduce Saturday home jerseys that pay homage to one of the most heralded foods on the planet (not applicable to vegetarians and vegans, however): Bacon. Not only is a strip of bacon embroidered on the front of the cap, the “Pigs” word mark across the chest contains a slab of bacon, proving to be both entertaining and unique when compared to some monstrosities in major and minor league sports. There are some terrible jerseys out there (*cough* Buffalo Sabres third jersey *cough*), but this one is actually quite creative and well-designed. This is all part of the franchise’s #SmellTheChange campaign, which has generated a buzz for the team on both social media and traditional channels. It has created quite a ripple on Twitter especially, prompting the team to dedicate a page to the initial reaction over the course of the first 24 hours, and it seems that the response from the general public is mostly positive. It’s hard for the average passive baseball fan to get excited about minor league news stories, but this is a strategy that will not only create exposure for the franchise, but most likely lead to a boost in merchandise sales as bacon enthusiasts everywhere will want to rock the ‘Pigs cap. The team launched a website for this campaign at SmellTheChange.com, which also showcases other uniforms that will be rolled out this upcoming season. 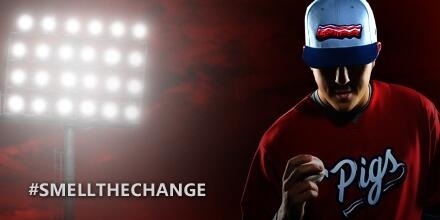 Fans of the bacon inspired uniforms can order caps, jerseys, and apparel at the team’s official online store. Are you a fan of this uniform or do you find it too gimmicky? Images courtesy of Lehigh Valley Iron Pigs.